This week is back-to-school for my kids which means back-to-writing for me. When you write, what pushes you? Daily minimums, goals, threats, treats? I think I'm going to do a combo of goal/treat this week. Denver has an incredible dessert restaurant, D Bar, on 17th. Has anyone gone? If you're writing romance, Guide to Literary Agents recaps the agent panel at RWA. Bookends talks about product placement in books . Michael Stackpole lists 9 must-have clauses for digital rights contracts. Guide to Literary Agents ignores the numbers in the irony of impossible. Rachelle Gardner sweetly answers the community's pressing questions. Janet Reid helps sift through the blogosphere and adds a much needed agent rating system. Steve Laube offers perspective by examining the changes in our culture. Dystel & Goderich talks cover art and its usual suspects. SlushPile Hell gives a short list of things not to include in your query. Pimp My Novel says when marketing your book, don't forget traditional media like radio. KT Literary says every author should have a website and a blog. BBC News explains why book signing are becoming such a performance. Blood Red Pencil offers valuable promotion ideas. WIP it gives advice for protecting your online reputation. Nathan Bransford tells how to write a novel. Writer Unboxed discusses cliff-hanger chapter endings. SFWA offers 5 free to-do list trackers to keep your writing on track. Janice Hardy explains how to ask for feedback. Kidlit discusses character stereotypes in a vlog--her Rubik's Cube will blow your mind. Stet explains how to help your readers suspend belief. Adventures in Children's Publishing rounds up WriteOnCon: see days 1, 2, and 3. Wordplay tells when to use pronouns. Weronika Janczuk of D4EO Literary. D Bar looks fabulous. 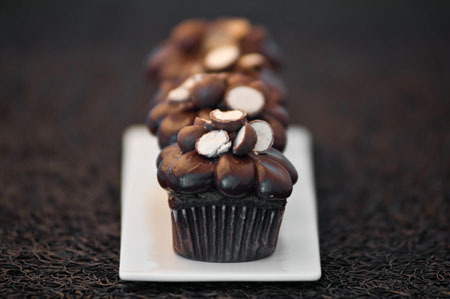 In Fort Collins, visit The Chocolate Cafe for similar pleasure-coma-inducing goodness. Another superb round-up! We're elated to be included. Thanks so much! So much good information (including Jenny's comment about The Chocolate Cafe -- I've been wanting to check that place out). Great links. But the picture of that cupcake...wow. I will visit the dessert place next time Im in Denver.